Planet Leicester Bakers was founded by Michelle Stratford in 2014. On this page you will find further information on the business, its founder and how it works. Specialist services for individuals, business and communities are available; including training, team-building and public speaking. In addition, community based projects and initiatives are a core part of the business’s activities. Michelle also runs a fortnightly micro-bakery from her home doorstep north of Leicester City which locals can subscribe to. Contact Michelle to find out more about any aspect of the business. Michelle Stratford has over 25 years of experience working in the charity and community sector, at international and local levels. This included work as a tutor in community adult education and health projects. In 2013 she began to look at ideas to develop her own social enterprise and Planet Leicester Bakers was the result! Michelle is a fourth generation home bread baker. She was taught to bake bread by her mother as a child. Following research and visiting community bakeries around the country, Michelle decided to take the path of becoming a Bread Angel. She started up her own home-based micro-bakery, before securing the funding for the Sharing Bread community project. Further community project work followed. Michelle settled in Leicestershire in 2002 with her partner, a professional youth and community manager. For more information on Michelle’s professional background check out her profile on Linked In. Rachel Watson – charity sector professional. Visit the ‘Core Values‘ page to find out more about the way Planet Leicester Bakers operates. 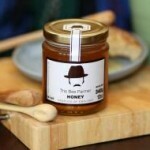 Local honey from David, The Bee Farmer, a fellow micro business, is used in the bakery and available to buy. The name ‘Planet Leicester Bakers’ came from a charity colleague’s comment that the beauty of the whole planet is represented in Leicester. The logo’s vibrant colours reflect this diversity and the communities we work with. Planet Leicester Bakers is more than just bread. It is also the people who take part in its projects and activities, in turn becoming Planet Leicester Bakers. This growing network of home bread bakers will, it is hoped, develop a passion and taste for bread that is made by ordinary people in their homes and communities. Helping us all to take more control of our bread and how it’s made. There are to date over 600 people across Leicester, Leicestershire, Rutland and beyond, who have engaged with Planet Leicester Bakers. Many have been trained in bread making through private workshops or community projects. As the public speaking diary fills up even more people are hearing about the potential of good bread to do good. And via social media as many as 2000 people regularly hear about the work of Planet Leicester Bakers. Web site designed by Michelle Stratford, Planet Leicester Bakers, with thanks to Martin Judd for technical advice and input. Photographs: Unless otherwise stated, all photos are credited to and property of Planet Leicester Bakers. All images are not to be re-produced without permission.